For other uses, see Cylinder (disambiguation). A cylinder (from Greek κύλινδρος – kulindros, "roller, tumbler") has traditionally been a three-dimensional solid, one of the most basic of curvilinear geometric shapes. 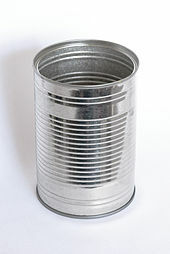 It is the idealized version of a solid physical tin can having lids on top and bottom. This traditional view is still used in elementary treatments of geometry, but the advanced mathematical viewpoint has shifted to the infinite curvilinear surface and this is how a cylinder is now defined in various modern branches of geometry and topology. The shift in the basic meaning (solid versus surface) has created some ambiguity with terminology. It is generally hoped that context makes the meaning clear. In this article both points of view are presented and distinguished by referring to solid cylinders and cylindrical surfaces, but keep in mind that in the literature the unadorned term cylinder could refer to either of these or to an even more specialized object, the right circular cylinder. The definitions and results in this section are taken from the 1913 text, Plane and Solid Geometry by George Wentworth and David Eugene Smith (Wentworth & Smith 1913). A cylindrical surface is a surface consisting of all the points on all the lines which are parallel to a given line and which pass through a fixed plane curve in a plane not parallel to the given line. Any line in this family of parallel lines is called an element of the cylindrical surface. From a kinematics point of view, given a plane curve, called the directrix, a cylindrical surface is that surface traced out by a line, called the generatrix, not in the plane of the directrix, moving parallel to itself and always passing through the directrix. Any particular position of the generatrix is an element of the cylindrical surface. A solid bounded by a cylindrical surface and two parallel planes is called a (solid) cylinder. The line segments determined by an element of the cylindrical surface between the two parallel planes is called an element of the cylinder. All the elements of a cylinder have equal lengths. The region bounded by the cylindrical surface in either of the parallel planes is called a base of the cylinder. The two bases of a cylinder are congruent figures. If the elements of the cylinder are perpendicular to the planes containing the bases, the cylinder is a right cylinder, otherwise it is called an oblique cylinder. If the bases are disks (regions whose boundary is a circle) the cylinder is called a circular cylinder. In some elementary treatments, a cylinder always means a circular cylinder. The cylinder obtained by rotating a line segment about a fixed line that it is parallel to is a cylinder of revolution. A cylinder of revolution is a right circular cylinder. The height of a cylinder of revolution is the length of the generating line segment. The line that the segment is revolved about is called the axis of the cylinder and it passes through the centers of the two bases. The bare term cylinder often refers to a solid cylinder with circular ends perpendicular to the axis, that is, a right circular cylinder, as shown in the figure. The cylindrical surface without the ends is called an open cylinder. The formulae for the surface area and the volume of a right circular cylinder have been known from early antiquity. A right circular cylinder can also be thought of as the solid of revolution generated by rotating a rectangle about one of its sides. These cylinders are used in an integration technique (the "disk method") for obtaining volumes of solids of revolution. A cylindric section is the intersection of a cylinder's surface with a plane. They are, in general, curves and are special types of plane sections. The cylindric section by a plane that contains two elements of a cylinder is a parallelogram. Such a cylindric section of a right cylinder is a rectangle. A cylindric section in which the intersecting plane intersects and is perpendicular to all the elements of the cylinder is called a right section. If a right section of a cylinder is a circle then the cylinder is a circular cylinder. In more generality, if a right section of a cylinder is a conic section (parabola, ellipse, hyperbola) then the solid cylinder is said to be parabolic, elliptic or hyperbolic respectively. For a right circular cylinder, there are several ways in which planes can meet a cylinder. First, consider planes that intersect a base in at most one point. A plane is tangent to the cylinder if it meets the cylinder in a single element. The right sections are circles and all other planes intersect the cylindrical surface in an ellipse. If a plane intersects a base of the cylinder in exactly two points then the line segment joining these points is part of the cylindric section. If such a plane contains two elements, it has a rectangle as a cylindric section, otherwise the sides of the cylindric section are portions of an ellipse. Finally, if a plane contains more than two points of a base, it contains the entire base and the cylindric section is a circle. This formula holds whether or not the cylinder is a right cylinder. This formula may be established by using Cavalieri's principle. The area of the top and bottom bases is the same, and is called the base area, B. The area of the side is known as the lateral area, L.
where d = 2r is the diameter of the circular top or bottom. For a given volume, the right circular cylinder with the smallest surface area has h = 2r. Equivalently, for a given surface area, the right circular cylinder with the largest volume has h = 2r, that is, the cylinder fits snugly in a cube of side length = altitude ( = diameter of base circle). where e is the length of an element and p is the perimeter of a right section of the cylinder. This produces the previous formula for lateral area when the cylinder is a right circular cylinder. Thus, the volume of a cylindrical shell equals 2π(average radius)(altitude)(thickness). Cylindrical shells are used in a common integration technique for finding volumes of solids of revolution. In the treatise by this name, written c. 225 BCE, Archimedes obtained the result of which he was most proud, namely obtaining the formulas for the volume and surface area of a sphere by exploiting the relationship between a sphere and its circumscribed right circular cylinder of the same height and diameter. The sphere has a volume two-thirds that of the circumscribed cylinder and a surface area two-thirds that of the cylinder (including the bases). Since the values for the cylinder were already known, he obtained, for the first time, the corresponding values for the sphere. The volume of a sphere of radius r is 4/3πr3 = 2/3 (2πr3). The surface area of this sphere is 4πr2 = 2/3 (6πr2). A sculpted sphere and cylinder were placed on the tomb of Archimedes at his request. In some areas of geometry and topology the term cylinder refers to what we have called a cylindrical surface. To repeat, throughout this section a cylinder is defined as a surface consisting of all the points on all the lines which are parallel to a given line and which pass through a fixed plane curve in a plane not parallel to the given line. Such cylinders have, at times, been referred to as generalized cylinders. Through each point of a generalized cylinder there passes a unique line that is contained in the cylinder. Thus, this definition may be rephrased to say that a cylinder is any ruled surface spanned by a one-parameter family of parallel lines. A cylinder having a right section that is an ellipse, parabola, or hyperbola is called an elliptic cylinder, parabolic cylinder or hyperbolic cylinder, respectively. These are degenerate quadric surfaces. This equation of an elliptic cylinder is a generalization of the equation of the ordinary, circular cylinder (a = b). Elliptic cylinders are also known as cylindroids, but that name is ambiguous, as it can also refer to the Plücker conoid. In projective geometry, a cylinder is simply a cone whose apex (vertex) lies on the plane at infinity. If the cone is a quadratic cone, the plane at infinity passing through the vertex can intersect the cone at two real lines, a single real line (actually a coincident pair of lines), or only at the vertex. These cases give rise to the hyperbolic, parabolic or elliptic cylinders respectively. This concept is useful when considering degenerate conics, which may include the cylindrical conics. A solid circular cylinder can be seen as the limiting case of a n-gonal prism where n approaches infinity. The connection is very strong and many older texts treat prisms and cylinders simultaneously. Formulas for surface area and volume are derived from the corresponding formulas for prisms by using inscribed and circumscribed prisms and then letting the number of sides of the prism increase without bound. Indeed, one reason for the early emphasis (and sometimes exclusive treatment) on circular cylinders is that a circular base is the only type of geometric figure for which this technique works with the use of only elementary considerations (no appeal to calculus or more advanced mathematics). Terminology about prisms and cylinders is identical. Thus, for example, since a truncated prism is a prism whose bases do not lie in parallel planes, a solid cylinder whose bases do not lie in parallel planes would be called a truncated cylinder. From a polyhedral viewpoint, a cylinder can also be seen as a dual of a bicone as an infinite-sided bipyramid. ^ "MathWorld: Cylindric section". Archived from the original on 2008-04-23. ^ Lax, Peter D.; Terrell, Maria Shea (2013), Calculus With Applications, Undergraduate Texts in Mathematics, Springer, p. 178, ISBN 9781461479468, archived from the original on 2018-02-06 . Wentworth, George; Smith, David Eugene (1913), Plane and Solid Geometry, Ginn and Co.
Wikimedia Commons has media related to Cylinder (geometry). Wikisource has the text of the 1911 Encyclopædia Britannica article Cylinder. Look up cylinder in Wiktionary, the free dictionary. Weisstein, Eric W. "Cylinder". MathWorld.